Alison Baillie begins A Fractured Winter by immediately creating a mysterious atmosphere. Not only does a young child vanish but ex-pat Olivia receives a strange rather threatening note and has a feeling she is being watched. What has happened to poor Sandra who seems to have disappeared without trace, what does Olivia have to hide and could the two be connected? The opening chapters certainly grab the attention and had me hooked. With various settings including the evocatively described Switzerland, there is a real sense of this being in the Nordic Noir genre. Of course, Switzerland isn’t one of the Scandinavian countries so this book can’t really be classed as Scandi Crime. I was trying to think of an alternative label but all I could come up with was Swiss Noir which sounds too much like a rather tasty chocolate bar! Although as chocolate can be a bit moreish, it’s perhaps not a bad comparison as I often found myself thinking ‘just one more chapter’. It was also particularly appropriate that when I was reading this back in March, we were in the grip of ‘The Beast from the East’, when snow brought most of Scotland to a halt. I couldn’t help but think how the Swiss would be laughing at our inability to cope! Throughout the book Alison Baillie creates a dark atmosphere, rather chilling at times as she explores topics such as consent, abuse, neglect and sects. Suspicion was cast on several characters, many of whom seemed rather shady to me. Olivia seemed rather naive at times, rather too trusting. There were some people in particular who set alarm bells ringing for me but who she seemed completely taken in by. The author has drawn on her own experiences as an ex-pat living in Switzerland to great effect and I was really pleased to see Portobello, another place she knows well, featuring. 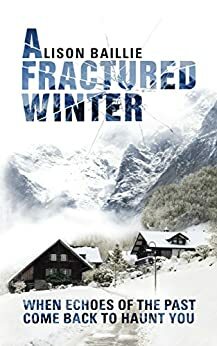 A Fractured Winter is a compelling read looking at a fractured community and shattered lives. Alison Baillie builds up the tension steadily throughout until the mysteries within the book are finally resolved. Fans of Nordic Noir should watch out for this psychological thriller.